We decided to risk the Guildford Arms. I say ‘risk’ because our on our last visit we had a very uncomfortable experience there. Admittedly we arrived late and not too sure we wouldn’t be turned away. However on being welcomed, a rush job was done with our meals – especially the partially cooked potatoes, making the whole visit a pretty disappointing expense. This was a pity as we have never experienced this at the sister restuarant, ‘Inside’. Ah but everyone deserves a second chance. Even if they seem to spend more time and effort advertising and writing in the local glossies than actually cooking. 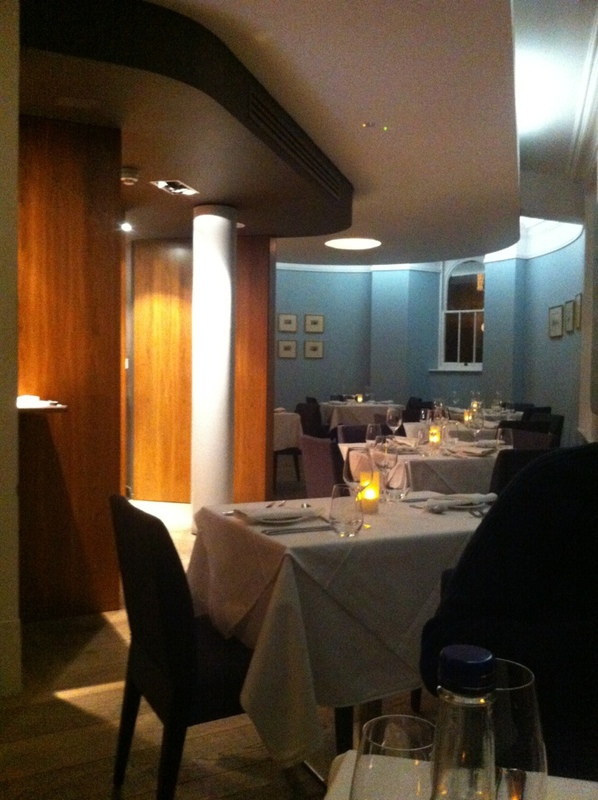 The environment at the Guildford arms was very pleasant: a wood clad room and jazz. They even had really clever fake candles that flickered in a frosted glass. Although I did wonder why they are needed. Is the cost of wax prohibitive these days? Are the papers full of reports of restaurants burned down by escapee candles? Equally mysterious was the two cubicle toilet with one elongated sink. It was very sophisticated in appearance, but if the two cubicles were used at similar time, there’d be a queue for the single tap. Watch our for that. 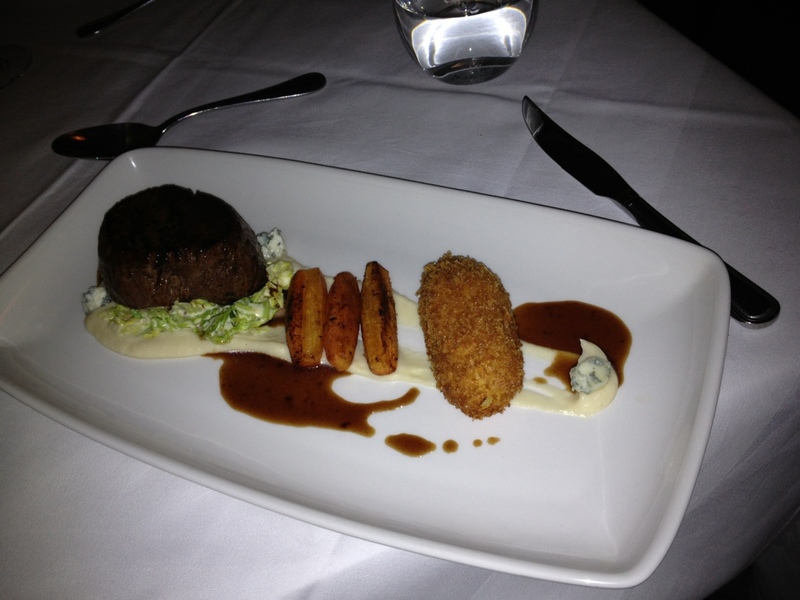 I began by enjoying a very rich roquefort souffle, but then a scan of the mains menu presented a challenge. It didn’t leave me in a quandary of which exciting meal to pick, so much as trying to infer what possibly could have something exciting lurking underneath the dsecriptions. While I very much enjoy ‘traditional with a twist’ (see the Rivington review) the menu at the Guilford arms was very traditional with a very subtle twist, almost too subtle to notice. 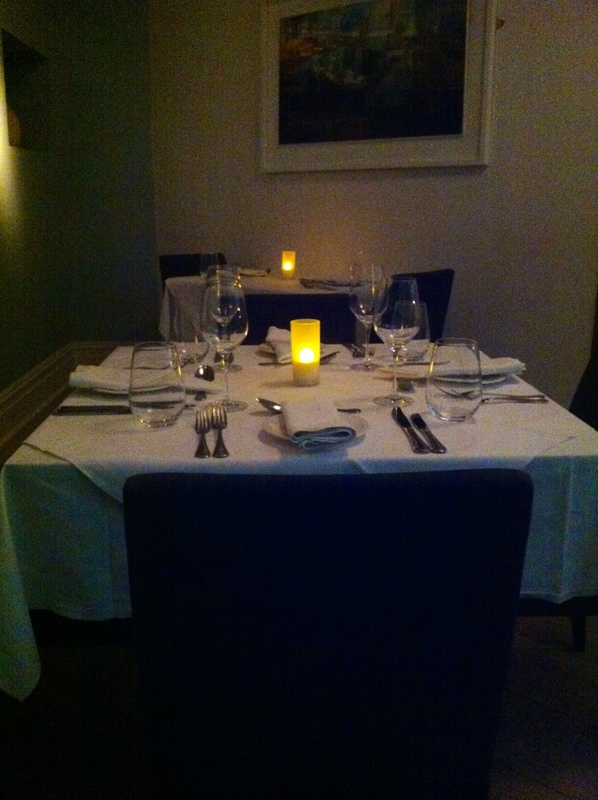 We were not entirely forsaken to a single flavour: corn purée accompanied the guinea fowl and blue cheese with the steak. In fact following the long agony between starter and main (what is with these waits?) 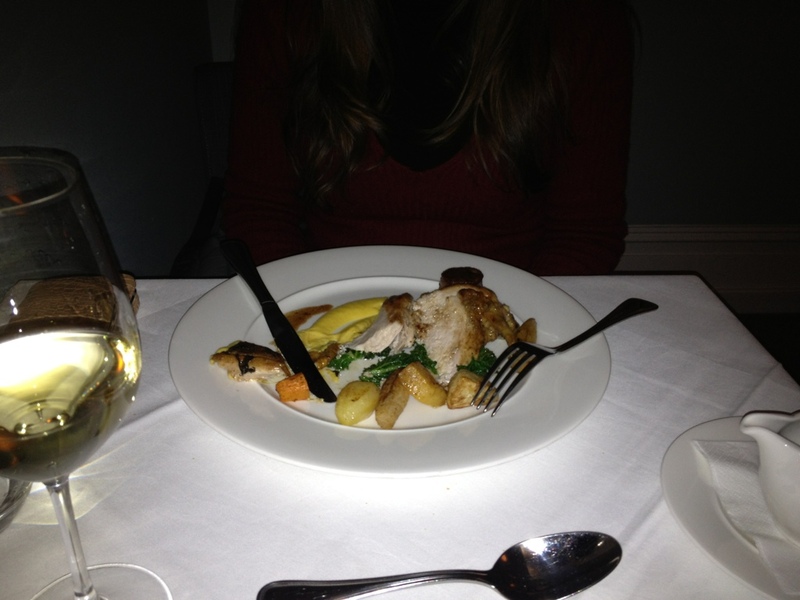 the roast guinea fowl with bacon and beef fillet with supplement arrived and were delicious. It’s hard to describe what went so right with these dishes- clearly not their descriptions on the menu. Both were hugely reminiscent of a good English roast. I mean of the standard that your good cook friend would make you rather than an £7 a head carvery plus plate design and elegant portion sizes. I appreciate that sounds like I have missed the point, but I would go so far as to say (on this occasion) that they were absolutely and without reservation flawlessly cooked, taking the dishes to their best possible performance. This very traditional seems to be defining Guildford’s market. I had a sneak peak at it’s more popular sister restaurant Inside’s menu, and they at least tossed chorizo into one of the meals. This is probably more my style. Mark’s and Spencer have my demographic tagged. Fortunately the dessert menu presented more sparky selections – oh that trusty course ‘dessert’. Some of them extended to the odd spice, albeit in the traditional combinations of ginger and rhubarb or vanilla and cream. The ginger and rhubarb was a brilliant balance of the two flavours- a rare achievement having sampled many attempts at this combination, many overdo the ginger. 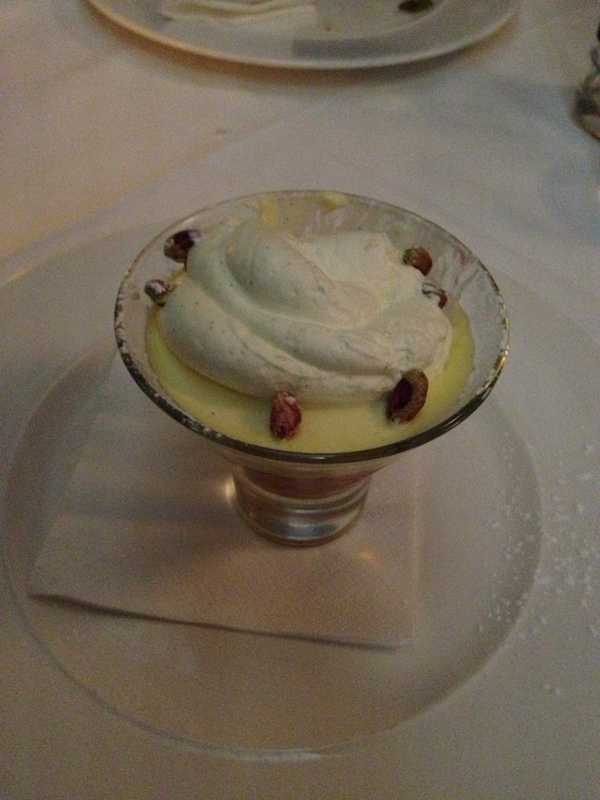 But this being part of a trifle, I had to fight through clouds of cream to reach this harmonious performance. Leave trifle in the seventies. The only part worth keeping is the sponge fingers in jelly. 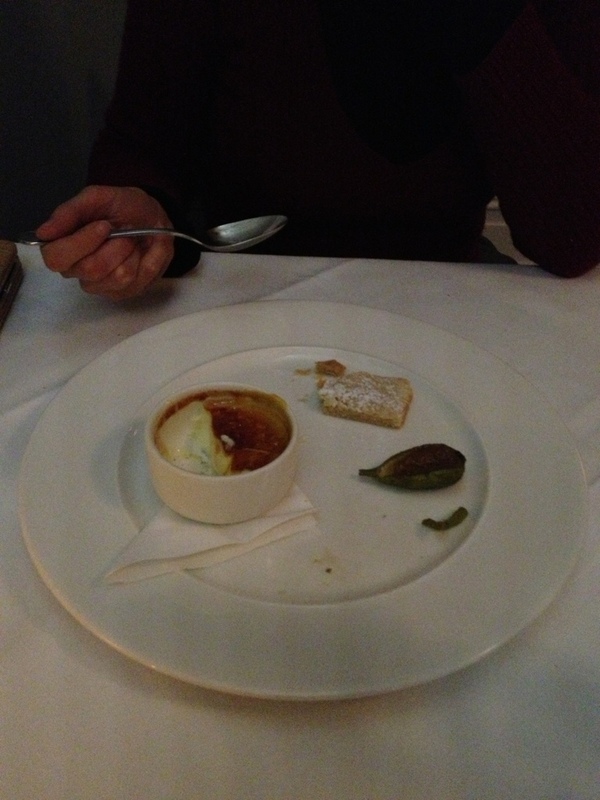 The other dessert was creme brûlée with cardamom shortbread. For those of you who think that shortbread is best served with caramel and chocolate on top you need to try this- a way more sophisticated twist than millionaires shortbread. Desserts compounded the reality that the small portions were large enough. We were now completely satiated. I ordered a black coffee to finish with. Think it was an Americano, but I can’t get excited.about the difference between this and a filter coffee. Can you? It came with such rich stiff frothy milk in a jug on the side that it quickly evolved into a cappuccino. I have no faith in my own convictions. We were warned that the truffle on the side came with cognac. This review was of the restaurant upstairs.